This is a guest post by Simon Kiss. Few chemicals have attracted as much media and scientific attention as bisphenol A (BPA). This common chemical has been accused being a cause of everything from obesity to premature onset of puberty to skewing the gender ratio to cardiovascular disease. Canada, Denmark, France, the EU and many US states have adopted measures prohibiting polycarbonate baby bottles made with BPA. And yet, reading the fine print on many of these regulatory decisions suggests massive uncertainties underlying the assertions that current exposure to BPA is harming us. For example, see the the World Health Organization’s recent assessment here. If the science is so conflicted, why did some jurisdictions adopt regulatory bans on products made from BPA while others did not? Before the United States ever took action at the federal level (at the request of the plastics industry, not environmental groups, mind you), Canada and a number of US state legislatures began doing so. When I initially got interested in this case, it seemed that the Canadian media were covering the issue far more than in other countries. This proved to be the case, but I also thought that the varied legislative paths experienced in US states offered the opportunity for a natural experiment testing the effects of media coverage about BPA on whether US state legislatures considered or adopted bans on products made with BPA. The short answer is that media attention to BPA helped initiate and sustain attempts at regulation. Thus, BPA regulation did not follow a traditional path of diffusion—whereby one state’s actions lead other states to act similarly. Instead, local news stories within that state helped to produce a response from state lawmakers. My analysis—recently published here (ungated)—combines information on news stories about BPA in major daily newspapers with information on state legislative activity regarding BPA. After account for several other factors besides media coverage I find that news stories were consistently linked to the chance that a state legislature would consider legislation banning products made with BPA. And even though this coverage did not affect the chances that the legislature would ban BPA, in 8 of the 9 states that have banned it, the ban only passed after a previous legislative session had first considered the ban. Thus, news coverage appears to have contributed indirectly to several outright bans. These findings have two important lessons. First, at the state level, the policy response to concerns about BPA is driven more by media coverage than by scientific concern. This suggests that, second, media coverage of complex risks can drive policy-makers to action even in the absence of scientific consensus. Thus, journalists must be cautious in describing the research—lest their coverage help to produce an overreaction to uncertain science. We thank Mass Communications and Society and Taylor and Francis for ungating this article. Image from North Carolina Health News. The most prolific way academics seek the attention of the public and policy makers is by writing op-eds in national newspapers. Does this type of writing give policy makers or the public what they need from academics? I am not so sure and an interesting article about the relationship between academics and policy makers in the Chronicle of Higher Education supports this view (at least in my mind). The following guest post is from Adam Alter, an assistant professor of marketing and psychology at New York University’s Stern School of Business, and the author of Drunk Tank Pink: And Other Unexpected Forces That Shape How We Think, Feel, and Behave. This piece was adapted from an earlier post at Psychology Today. On September 8, 1900, a terrible storm made landfall in the city of Galveston, Texas. The Galveston storm was five times deadlier than Hurricane Katrina, and in today’s dollars it’s still the second costliest hurricane in U.S. history. But as the hurricane approached the Texas coast, no one was quite sure what to call it. When it sailed southeast of Cuba, the U.S. Weather Bureau described it inelegantly as a “storm of moderate intensity (not a hurricane).” It was impossible to link the storm to Galveston or any other place until it made landfall, because, like so many tropical storms, it zigged and zagged before making a beeline for Galveston. In the aftermath, the storm acquired many names: the Hurricane of 1900; the 1900 Galveston Hurricane; the Great Galveston Hurricane; the Galveston Flood; the Great Storm; the 1900 Storm. It took more than half a century, but in 1953 the World Meteorological Organization began naming storms before they made landfall. As the Organization explained, “the use of short, distinctive given names…is quicker and less subject to error than the older more cumbersome latitude-longitude identification methods.” Today, the world is divided into ten distinct hurricane regions, and each region names its hurricanes with locally familiar names. In 2013, the first storm to hit the North Atlantic will be named Andrea, the first to hit the North Pacific will be named Ana, and the first to hit the Southwest Indian will be named Anais. The second storm in each region will take a name that begins with the letter B, the third with the letter C, and so on (though the lists omit the letters Q, U, X, Y and Z). These names are chosen arbitrarily, and the World Meteorological Organization prefers alphabetical lists only because they are more “efficient and organized” than randomly ordered lists. Like many decisions that seem arbitrary at first, hurricane naming has unexpected practical consequences. 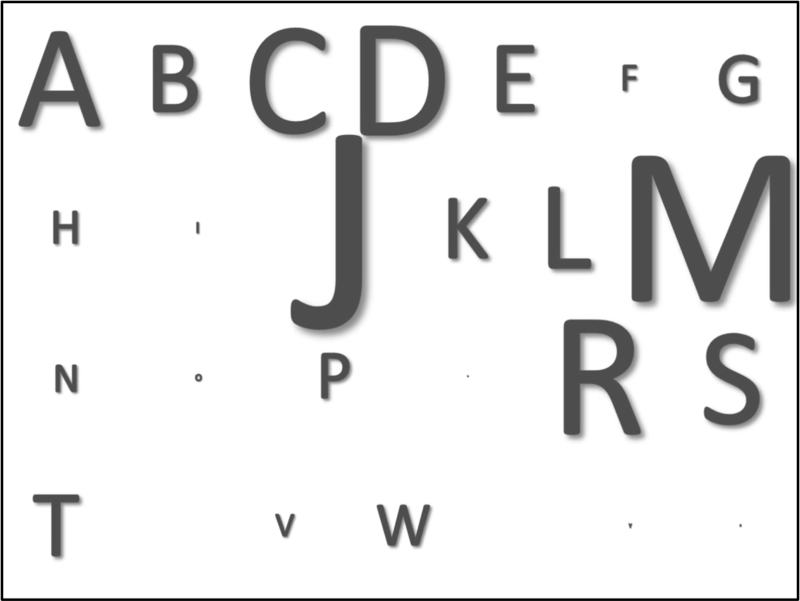 In the mid-1980s, Belgian psychologist Jozef Nuttin showed that people like their initials more than they like other letters in the alphabet. For example, in one study Nuttin found that Europeans who spoke 12 different languages were 50% more likely to identify their own name letters among their top six favorite letters of the alphabet. In a more recent twist on Nuttin’s basic result, psychologist Jesse Chandler and his colleagues found that people donate significantly more money to hurricanes that share their initials. So Roberts, Ralphs and Roses donated on average 260% more to the Hurricane Rita relief fund than did people without R initials. Also in 2005, people with K initials donated 150% more to the Katrina relief fund, and in 2004 people with I initials donated 100% more to the Ivan relief fund. This information isn’t just idly interesting. Since we know that people are more likely to donate to hurricanes that share their first initials, the World Meteorological Organization has the power to increase charitable giving just by changing the composition of its hurricane name lists. In the United States, for example, more than 10% of all males have names that begin with the letter J—names like James and John (the two most common male names), Joseph and Jose, Jason, and Jeffrey. Instead of beginning just one hurricane name with the letter J each year (in 2013, that name will be Jerry), the World Meteorological Organization could introduce several J names each year. Similarly, more American female names begin with M than any other letter—most of them Marys, Marias, Margarets, Michelles, and Melissas—so the Organization could introduce several more M names to each list. CAPTION: This figure illustrates the relative frequency of each first name initial in the U.S. population by linking the size of each letter to its frequency as an initial. Ms, Js, As, and Rs are very common; Qs, Us, Xs, and Zs are obviously less common. This is just one simple illustration of how policymakers can capitalize on our psychological foibles to encourage beneficial outcomes. I discuss how so-called cues, like our names, influence our thoughts and behaviors in Drunk Tank Pink, and propose a number of other policy solutions in the book that similarly address real world problems without costing policymakers or the government very much at all. Understanding human psychology sometimes gives you the sort of leverage that you might achieve otherwise only with millions of dollars in inefficient brute force policies. This is a guest post by GW political scientist Robert Stoker. His previous guest posts for us are here, here, and here. Bob elaborates on his post below over at HuffPo. The Social Security program currently has a cash deficit. That is, the payroll tax that finances the federal government’s largest social program is not generating sufficient revenue to pay current benefits. As a result, the federal government is borrowing money to pay Social Security benefits. On its face this suggests that the Social Security program is contributing to the nation’s debt. However, the distinctive features of Social Security finance suggest otherwise. The Congressional Budget Office explains that our nation has two types of debts; those owed to the public and those the government owes itself. Debt to the public is owed to investors who have purchased Treasury securities. Debts the government owes itself are IOUs held by various government trust funds that have had surplus revenues in the past. The Social Security program ran a surplus from 1984 through 2009 (taking in more payroll tax revenue than was paid out in benefits). Of the estimated $16.3 trillion of accumulated federal debt through the end of 2012, $11.5 trillion was public debt and $4.8 trillion was debt held by various government trusts. The Social Security Trust Fund holds “assets” valued at $2.7 trillion. Of course, the idea of a trust fund “asset” is controversial, since this is money the government owes itself. Trust funds are not assets to the federal government because the assets of any given fund are offset by liabilities owed by the Treasury Department; their net value to the federal government is zero. However, the Social Security Trust Fund is an asset for the Social Security Administration. That is, it represents a legitimate claim on the treasury backed by the full faith and credit of the U.S. government. Beyond this, if you believe that the nation’s debt is $16.3 trillion and counting, it is inconsistent to deny that trust fund balances (which compose about 30% of the debt) are real. When the Social Security program has a cash deficit, the Social Security Trustees request repayment for some of the Treasury securities they purchased when the program was in surplus (when payroll tax revenues were greater than the cost of benefits). Since the government is currently in deficit, the Treasury Department must borrow money to finance these payments. However, the new borrowing does not increase total debt because this transaction is more akin to refinancing existing debt than accumulating new debt. If you owe a $5,000 credit card bill and you take a home equity loan to pay off the credit card, your total debt has not changed; you have refinanced the debt, transferring it from one financial instrument (and one creditor) to another. Much the same can be said about repaying the OASDI Trust Fund. The fund’s assets are composed of debts already accounted for as part of the nation’s total debt. When the Treasury borrows to pay current Social Security benefits, the debt owed to the Social Security Trust Fund is repaid, refinanced, and transferred to whoever purchases Treasury securities. Of course, the cost of refinancing the debt is a key concern. However, the only scenario in which repaying the Social Security Trust Fund can increase the nation’s debt is if interest rates are higher now than they were when the original debt was incurred. Given current market conditions (nominal interest rates are presently quite low, the rate on 10 year Treasury Bonds is around 2%), the more plausible claim is that refinancing the Social Security Trust Fund’s debt has reduced the nation’s debt slightly by reducing interest costs. The current cash deficit in the Social Security program is not contributing to the nation’s debt. This will remain true so long as the Social Security Trust fund holds Treasury Securities that are already counted as part of the debt (current forecasts suggest this will be so for approximately twenty more years) and interest rates remain low. Do Americans Trust Goverment Less Because It’s Become an Insurance Broker? Nevertheless, the declining level of trust in government since the 1970s is a fairly close mirror for the growth in spending on social insurance as a share of the gross domestic product and of overall government expenditures. We may have gone from conceiving of government as an entity that builds roads, dams and airports, provides shared services like schooling, policing and national parks, and wages wars, into the world’s largest insurance broker. Most of us don’t much care for our insurance broker. Nate suggests that the growth in spending on social insurance is changing what goverment does and perhaps making people trust the government less. The former is undoubtedly true. I am more skeptical about the latter. Here is why. Nate looks at the growth in entitlements as a percent of GDP, and categorizes spending on health care, education, and welfare as entitlements. (The data are available here.) 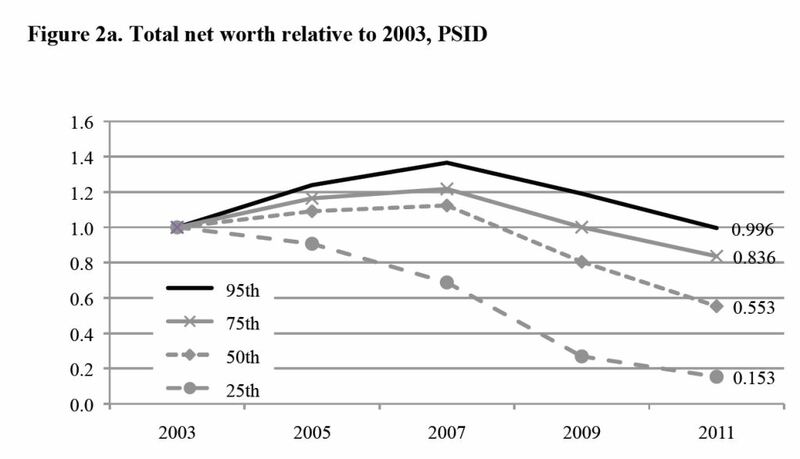 I think I’ve adequately replicated the trend he documents, though focusing on the period from 1958-2011. The two trends don’t appear to square that well. 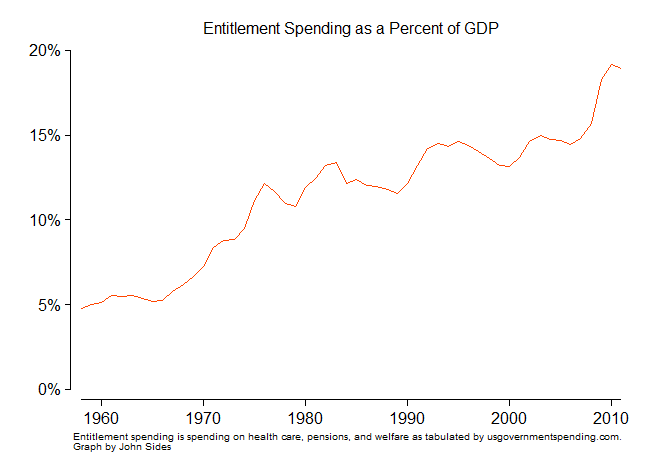 Entitlement spending increases consistently, if not linearly. 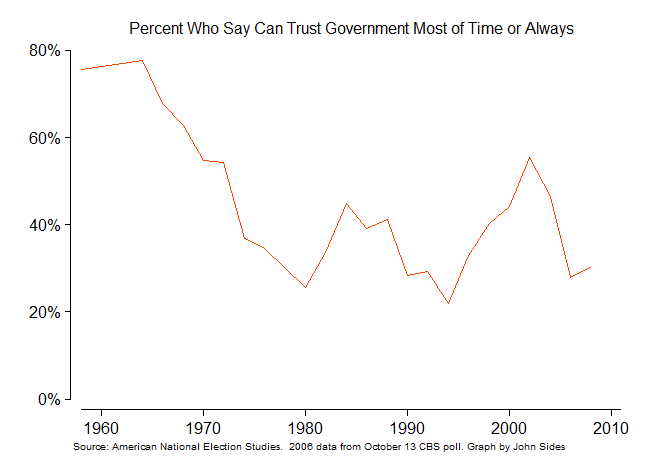 But trust in government has important peaks and valleys. It hasn’t simply declined since the 1970s. What happens if we plot the relationship for those years were we have both sets of data? 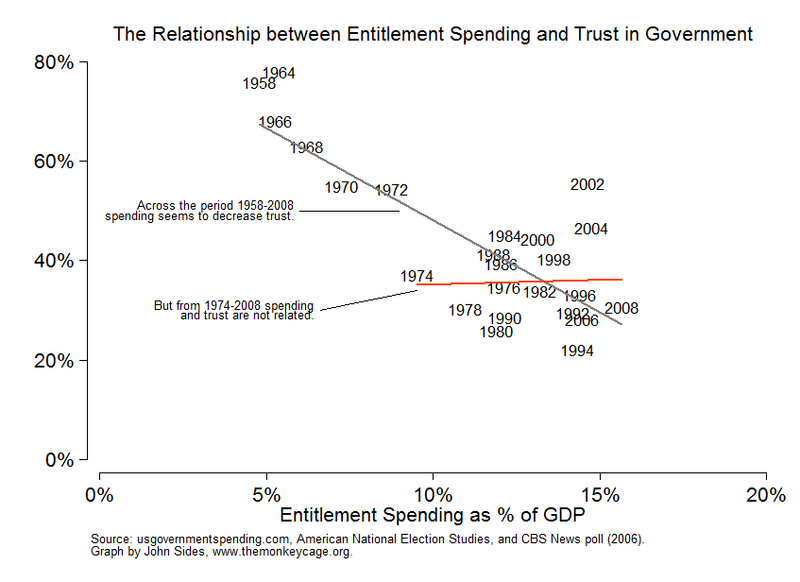 Using all the data, 1958-2008, there is a negative correlation: more entitlement spending coincides with lower trust in government. But this relationship leans heavily on the period from 1958-1972 (or 1958-1974 or 1958-1976—you can cut the data a couple different ways and get the same finding). Once we focus on the period from 1974 onward, there is no meaningful correlation. This is despite the fact that entitlement spending increased from 9.5% of GDP in 1974 to 15.7% in 2008. So a lot depends on how you want to interpret the decline from 1964-1972 or thereabouts. Entitlement spending did increase during this time—it nearly doubled—but there were also an economic slowdown, the Vietnam War, and Watergate. Of course, these data don’t speak to the more subtle question of whether popular conceptions of government have changed as government has devoted more resources to entitlements. That said, it’s also worth mentioning that entitlement programs like Social Security and Medicare are among the most popular (though less so Medicaid and welfare, obviously). People may not care for their insurance broker, but they do seem to like government insurance. Some insist that we can’t afford pork at a time when Congress is struggling to reduce the budget deficit. But pet projects are cheap, and if doled out strategically, they provide an efficient way for presidents and congressional leaders to build coalitions for broad-based national legislation, as Trinity College political scientist Diana Evans shows in her fine book Greasing the Wheels. Sign the Petition: No Death Star! Last May, this blog published my essay against building a Death Star. And, not to brag, but at the time I thought we had saved trillions* of lives. 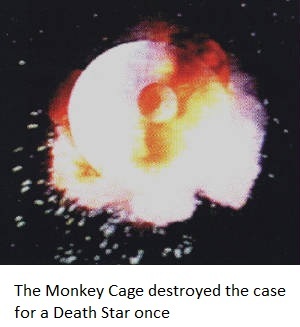 With the help of re-posts by Wonkblog, Gizmodo, and legions of social media warriors, the Monkey Cage squelched any thoughts of building a Death Star and saved the lives of countless planets. Imagine my shock, then, to hear that a petition to the White House had received the 25,000 signatures it needed to force an official response from the White House. I’ve got a bad feeling about this. 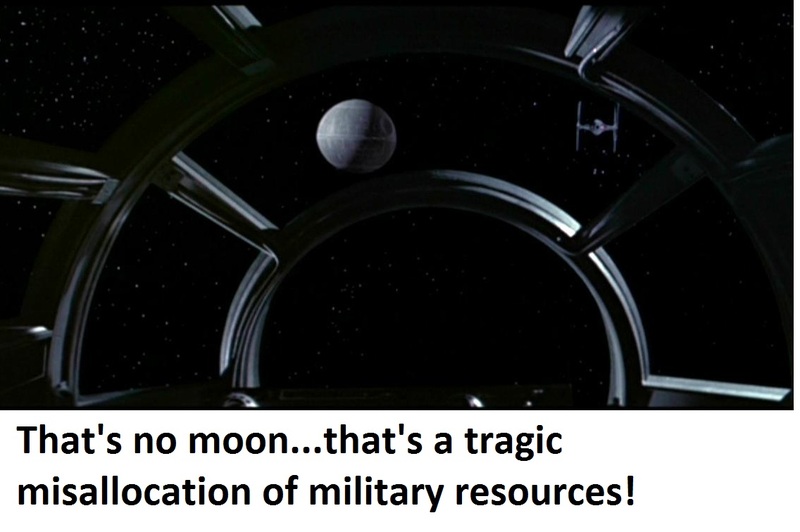 ban the development or deployment of a Death Star, or any other moon-sized space station capable of destroying a planet. 1) Compared to more discrete alternatives, the Death Star is an inefficient strategy for subduing the population and elites of the galaxy. 2) The money and materials used to build the Death Star would be put to better use upgrading the conventional weapons of the Imperial army. In the current budgetary environment, the second point is especially important. As we all know, the 2011 debt limit agreement included mandatory reductions in defense spending—the “sequester”—starting in fiscal year 2013. The Department of Defense budget is slated to decrease by $259.4 billion. And yet the advocates for a new Death Star plan to launch it in the midst of this austerity despite its$85.2 quintillion price tag. Perhaps you are wondering, is an anti-Death Star petition really necessary? Surely the Obama administration will treat the pro-Death Star petition like it’s some sort of joke, even if it means enduring criticism that it is “soft on Alderaan.” Perhaps. But having destroyed the argument for the Death Star once, I was surprised to find that the pro-Death Star forces had moved to in another venue, displacing the local population and threatening the galaxy. 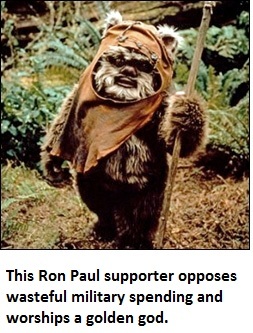 I fear they will continue to keep trying until the federal government sets a clear no-Death Star policy. So please, sign the petition. The planet you save may be your own. *My best guess, pending CBO scoring. This is a guest post by Bryan Jones, J.J. “Jake” Pickle Regent’s Chair in Congressional Studies at the University of Texas at Austin. His previous guest post is here. In an interview last year, I suggested that gun control was a policy ripe for rapid change. I thought so at the time because the policy was firmly lodged in interest-group politics and one side had won so much its demands were devoid of any relationship to reality and common sense. As Patrick Egan shows, as gun laws were weakened at the state level and in federal law, the violent crime rate declined and gun ownership fell. Acquiescence by the public, seemingly lack of harm in the policy, and a one-sided interest group contest all pointed to continued dominance of the gun lobby—if one uses standard approaches to prediction. But breakdowns often occur when one side seems to have won the policy battle—in a sense by taking too much. By overextending, groups have to defend essentially indefensible policies. It makes them more vulnerable, and that vulnerability may be traced by focusing on what Frank Baumgartner and I called a policy image—a summary of the general prevailing understanding of an issue’s basic character. Simplified policy images stem from basic human psychology and the social phenomenon of contagion. They can be very resilient, but they can also collapse quickly in the right circumstances. That an issue rises in collective attention is important (and often that can be fleeting), but even more important is how the issue is characterized when it is raised. Baumgartner, de Boef, and Boydstun demonstrate that support for the death penalty declined only when the prevailing policy image as discerned from careful analysis of press coverage shifted toward a frame focusing on executing innocent people. Newtown has stimulated a likely change in the prevailing policy image governing how people think about the gun issue. Previously the causal story circulating among the more attuned public and pushed by the gun lobby was this: the availability of guns had not affected the crime rate negatively and indeed may well have caused part of the general decline in the rate. For mass killings, which have not declined and may have increased, a different story was told: people kill people and anyway, nothing can stop determined or mentally unbalanced people from obtaining guns and using them in horrific ways (apparently unless all other citizens are armed). Because government can’t ameliorate the problem, it should not intervene. These are events that happen, part of life, and they cannot and should not be addressed through policy. Let’s call this the helpless frame. The conception that nothing can stop the slaughter may be breaking down. President Obama’s speech to the Newtown grieving directly addressed the helpless frame. The helpless frame is being challenged by the availability of guns frame, in which the simple availability of guns to dangerous people becomes the preferred explanation. If the problem is reconceived, government solutions are within the pale. Just what policy solution might be attached to the problem is unclear, but the lowest hanging fruit (where the gun lobby’s policy victories have exceeded the bounds of common sense) include an assault weapons ban, a high-capacity magazine ban, and improved background check procedures for gun purchases. Both of these respond to the availability of guns frame in a manner consistent with common sense.